A feud between President Trump and Rep. Ilhan Omar sparked dueling protests in Minnesota. 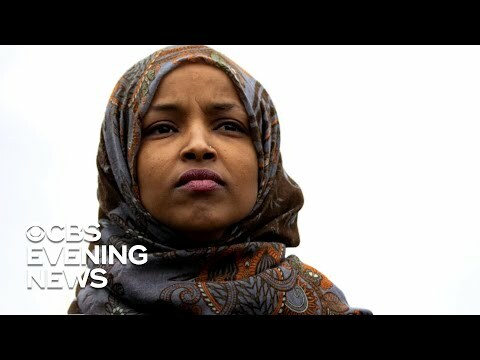 The conflict started after Mr. Trump tweeted a video of Omar, edited with images from 9/11. Weijia Jiang reports. Subscribe to the "CBS Evening News" Channel HERE: http://bit.ly/1S7Dhik Watch Full Episodes of the "CBS Evening News" HERE: http://cbsn.ws/23XekKA Watch the latest installment of "On the Road," only on the "CBS Evening News," HERE: http://cbsn.ws/23XwqMH Follow "CBS Evening News" on Instagram: http://bit.ly/1T8icTO Like "CBS Evening News" on Facebook HERE: http://on.fb.me/1KxYobb Follow the "CBS Evening News" on Twitter HERE: http://bit.ly/1O3dTTe Follow the "CBS Evening News" on Google+ HERE: http://bit.ly/1Qs0aam Get your news on the go! Download CBS News mobile apps HERE: http://cbsn.ws/1Xb1WC8 Get new episodes of shows you love across devices the next day, stream local news live, and watch full seasons of CBS fan favorites anytime, anywhere with CBS All Access. Try it free! http://bit.ly/1OQA29B --- The "CBS Evening News" premiered as a half-hour broadcast on Sept. 2, 1963. Check local listings for CBS Evening News broadcast times.